Well now you can find out exactly what happened when the boys in black and white played on 30th September. 7 years ago on 30 September 2008 – A stunning 45 yeard wonder strike from evil genius Ferrie Bodde set the Swans on their way to a 2 nil win over Championship rivals Preston North End at Deepdale. Jordi Gomez grabbed the Swans 2nd from the penalty spot in the 80th minute. 9 years ago on 30 September 2006 – Rory Fallon gave the Swans a half-time lead thanks to his 42nd strike at the City Ground, but three second half goals from top of the table Nottingham Forest meant the Swans returned home pointless in Coca Cola League One. 12 years ago on 30 September 2003 – League leaders Hull won this 1st v 2nd clash at the KC Stadium, as the Swans went down to a 1 nil defeat in front of a 20,903 crowd in Nationwide League Division Three. The kick-off was actually delayed for 15 minutes due to crowd congestion! Defender Richard Duffy was sent off for the Swans after 82 minutes to round off a miserable evening. 15 years ago on 30 September 2000 – Off the field problems were of more corncern to the Jack Amry as the Swans suffered a 2-0 defeat to Bury in Nationwide Football League Division Two, in front of a Vetch Field crowd of 5,362. 18 years ago on 30 September 1997 – A crowd of just 889 witnessed Jan Molby’s Swans lose 2-1 at the Vetch Field to Barry Town in the FAW Invitation Cup after Shaun Chapple had given the Swans a first half lead. 20 years ago on 30 September 1995 – It was no surprise that Frank Burrow’s Swans, who were without a league win in 7 games, succumbed to a 3-0 defeat at Burnley in the Endsliegh Insurance League Division Two. Only some heroics from Roger Freestone in the Swans goal – including a penalty save – prevented the Clarets scoring even more goals. 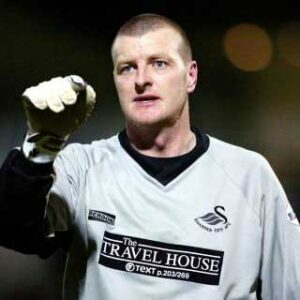 26 years ago on 30 Septmber 1989 – Roger Freestone made his debut for the Swans in a goalless draw with Notts County at the Vetch Field. A crowd of 3,075 watched an impressive debut from the former Chelsea keeper in this Barclays League Division Three fixture. 29 years ago on 30 September 1986 – Terry Yorath’s Swans beat Aldershot 2-1 at the Vetch Field, as a 6,404 crowd enjoyed goals from David Hough and Nigel French, meaning the Swans moved up to 2nd in the Today League Division Four table. 34 years ago on 30 September 1981 – Alan Curtis was sent off for the first time in his career as the Swans slumped to a 2-1 defeat against East German outfit Lokomotiv Leipzig in the UEFA European Cup Winners Cup 1st round 2nd leg. A 2nd half goal from Jeremy Charles gave the Swans something to shout about as they were knocked out of the competition 3-1 on aggregate. 37 years ago on 30 September 1978 – Goals from Jeremy Charles and Robbie James earned the Swans a 2-1 win over Brentford at the Vetch Field in front of 11,470 in this Football League Third Division game.